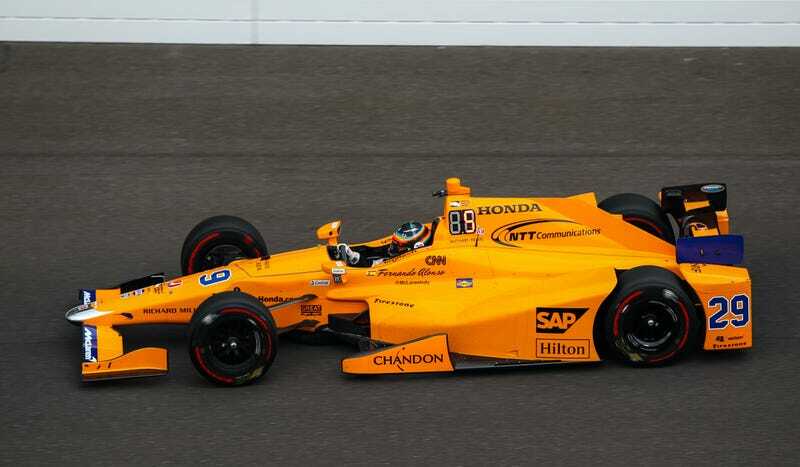 Two-time Formula One champion and Indianapolis 500 rookie Fernando Alonso made it into the top Fast Nine in today’s qualifying session for the 101st Indy 500. Qualifying points are assigned by starting position, so no matter where Alonso lands in the top nine qualifiers tomorrow, he’ll score more points in an orange car than he has all year with the McLaren F1 team. Hometown hero Ed Carpenter, whose shop is based right there in Speedway, Indiana, took the fastest lap of the day, with an average speed of 230.468 mph for his four qualifying laps. Last year’s winner Alexander Rossi ran fifth fastest. Fernando Alonso was seventh fastest with a 230.034 mph average speed, and boy, was he antsy after his run. A combination of weather delays that combined everyone’s qualifying session into an already shortened today’s qualifying session such that IndyCar expected qualifying to run late past its 6:00 p.m. planned cut-off time. Sébastien Bourdais’ devastating crash during qualifying also took a while to clean up, ensuring that no one was able to get a re-run for sure. Everyone got one run, and that’s it. But fret not, Alonso: you’ve already gotten something from his epic Indianapolis vacation. Even if he flops in qualifying tomorrow, Alonso will still start the Indianapolis 500 in the top nine. That’s great for is Indianapolis 500 fun, but painful on the F1 side for sure. Aren’t we glad Honda’s IndyCar engine actually works? Lost as to how Indianapolis 500's qualifying works? Check out our explainer here.